The global personal watercraft market is expected to witness a moderate demand attributed to increasing participation in watersport activities. Manufacturers are increasingly adopting nanotechnology to incorporate advanced technological features. In addition, the manufacturing companies are increasingly opting for plastic as an important ingredient in order to offer low-cost watercrafts. As participation in the water sport activities has led to increasing accident and fatality rates, manufacturers are mainly concentrating on offering personal watercrafts equipped with safe features. The report offers in-depth insight on the important aspects of global personal watercraft market and further provides information related to growth factors, competitive landscape, important segments and factors fuelling the market growth. Growth of the global personal watercraft market is mainly bound to various macro-economic and micro-economic factors. The report reveals that the global personal watercraft market is mainly driven by increasing participation in the water sport activities. As participation in the water sport activities benefit the cardiovascular health and strengthens muscles, demand for the personal watercrafts will continue to remain high. With increasing rate of fatalities and accidents in water sports, manufacturers are mainly focusing on developing personal watercrafts that are equipped with safety features such as multi-faceted features and sound signaling devices. Moreover, the manufacturers are also adopting enhance technological features such as the nanocomposite technology that enable the manufacturers to create light-weight hull, liner and deck. Further, adoption of nanotechnology enables the manufacturers to control the flow of materials and conditions during the molding process. As need for safety and security arises among the people participating in water sports, demand for the personal watercrafts is expected to remain high among the police organizations such as water or marine police. Increasing demand for personal watercrafts among the coast guards is further expected to impact growth of the global personal watercraft market. Manufacturers are further incorporating advanced technological features such as GPS and sensors in order to gain a competitive edge over the other market players. In the next section, the global personal watercraft market is segmented as product type, engine displacement and sales channel. On the basis of product type, the global market is segmented into stand up, one seater, two seater and three seater. Based on engine displacement, the global market is segmented as Below 800 CC, 800-1000 CC, 1000-1500 CC and Above 1500 CC. By sales channel, the global market is segmented as independent dealers, brand authorized dealers, brand authorized dealers and third party e-commerce. On the basis of region, the global market is segmented as North America, Latin America, Europe, Japan, APEJ and MEA. Key players in the global personal watercraft market are BRP Inc., Honda Motors. Co., Ltd., Kawasaki Motors Corp and Yahama Motors Co., Ltd.
With surge in the fatality and accident rates while participating in various water sports activities, the manufacturers of personal watercraft are focusing on offering personal watercrafts equipped with safety features such as sound signaling devices and multi-faceted features. Demand for personal watercraft will continue to increase bound to increasing participation in the water sports activities globally. Increasing participation in various watersport activities improves the cardiovascular health and strengthens muscles. However, participation in water sports has led to significant increase in pollution. These factors are bound to impact the global market growth of personal watercraft significantly. 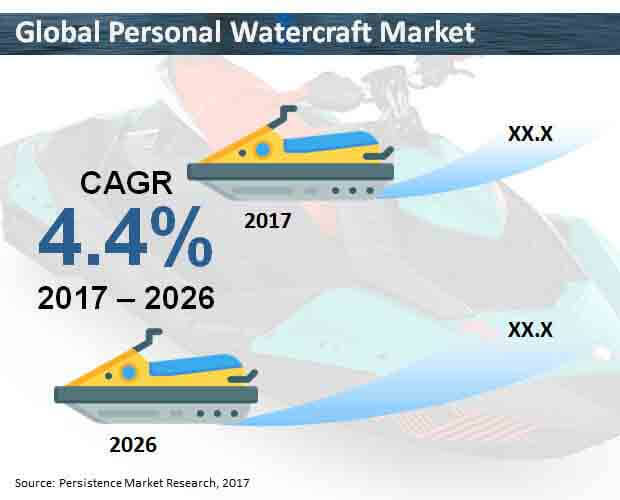 According to Persistence Market Research, the global personal watercraft market is expected to represent a value of over US$ 140,000 Mn by the end of 2026. As participation in watersports continue to increase, demand for the personal watersport is expected to remain high. Participation in watersports will continue to increase as it enables the end users to strengthen their muscles and improve their cardiovascular health. Moreover, increasing participation in various watersport activities helps in relieving stress of the customers. These factors will continue to boost sales of personal watersports globally. While the rate of fatality and accidents continue to rev up during participation, manufacturers are increasingly concentrating on offering personal watercraft products equipped with enhanced features and technology. In order to offer personal watersports with safety features, the manufacturers of personal watersports are increasingly focusing on development of multi-faceted watercrafts. Moreover, the manufacturers are further concentrating on adopting enhanced technology such as nanocomposite technology to create hull materials, which reduces the weight of liner, deck and hull. Moreover, adoption of the nanotechnology further allows the end users to control the material flow conditions during the process of molding. The manufacturers of the personal watercraft are also opting for plastic as an important ingredient to manufacture watercrafts in a cost-effective manner. With the growing need for safety and security among the people participating in watersports, demand for personal watercrafts will continue to increase among the police organizations such as marine or water police. Moreover, increasing demand for patrolling in the water to ensure safety among people participating in watersports is further expected to boost sales of the personal watercrafts globally. These factors will continue to contribute towards growth of the global personal watercraft market. Major companies are mainly focusing on product innovation and development in order to gain a competitive edge over the other market players. However, small companies are catering to the demands of the personal watercraft at a local level, due to which these players are mainly offering their products to a small section of the population. In addition, the manufacturing companies operating in the global are further focusing on incorporating advanced technological features such as GPS and sensors. Bound to these factors, growth of the global personal watercraft market is expected to witness significant growth. With the increasing demand to participate in the water sports activities, demand for three seater watercrafts will continue remain high globally. On the basis of product type, the three seater segment is expected to witness robust revenue growth, recording a value of over US$ 79,000 Mn by the end of 2026. During the forecast period, the three seater product type segment is expected to witness the highest CAGR. Based on engine displacement, the above 1500 CC segment is expected to generate significant revenues, accounting for a value of over US$ 51,000 Mn by the end of 2026. However, the 1000-1500 CC engine displacement segment is expected to reflect a healthy CAGR throughout the forecast period. By sales channel, the brand authorized dealers segment is expected to represent the highest revenue growth, recording a value of over US$ 15,000 Mn by the end of 2017. In contrary, the third-party e-commerce sales channel segment is expected to witness the fastest growth in the global market. Leading market players operating in the global personal watercraft market include Yahama Motors Co., Ltd., BRP Inc., Honda Motors. Co., Ltd. and Kawasaki Motors Corp.